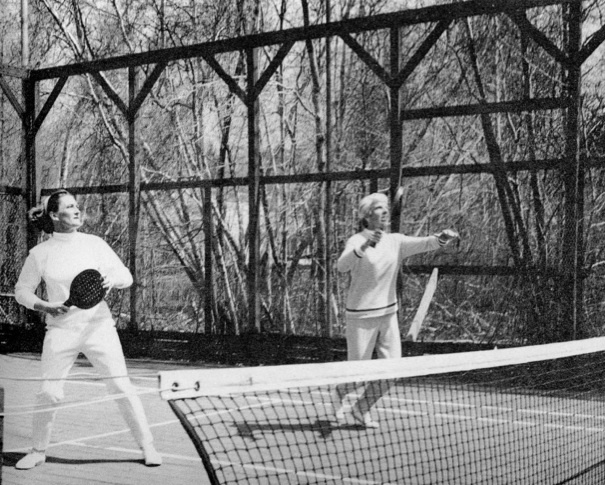 Charlotte Lee made a mark in tennis before becoming an outstanding platform tennis champion, despite only starting to play the game in her early forties. Playing with a variety of partners, she won three straight National Mixed (1961-1963), and then again in 1965, and five National Women’s (1961, 1963, 1964, 1966, and 1967). She was a master tactician of the game. (Short Hills Country Club, NJ). Lee first won recognition in national tennis circles, with her most successful year being 1937, when she reached the semifinal round of the National Singles Indoor Tournament at the Seventh Regiment Armory in New York City, as well as the Mixed Doubles semifinals with Don McNeill (no relation). 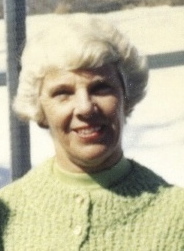 She later won the USLTA Senior Singles in 1961, and the Women’s Doubles in 1963 and 1965, with Kay Hubbell, and competed in the Irish lawn Tennis Championships in 1969. She first picked up a paddle at age 42 in 1957, when she started playing for her husband’s sake. He needed a partner when he took up the game for health reasons, and she discovered paddle was “made to order” for her. 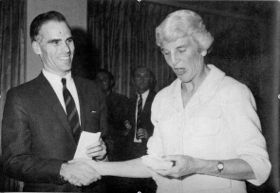 Four years later she won the first of 16 National titles—eight Women’s, five Mixed and three Senior Women’s 50+—and be a runner up eight times. She also won an almost uncountable number of club and state championships in both mixed and women’s play. During her active playing career, Charlotte won the respect and the admiration of her partners and opponents alike. Ask those paddlers who know her to describe Charlotte in a sentence and, most often, they will speak of her vivacious personality, her loyalty to friends, her uncompromising value of sportsmanship, her graciousness and modesty, and then they will mention her great playing ability. Lee won the Nationals with a variety of partners and, when asked how she found each of these competent competitors, the answer was that Charlotte always sought out by her partner-to-be. She said since she was always the oldest woman competing, and therefore might not have as many years of competition as the others, she rarely stayed with a partner for more than one National victory and then, possibly, once defending the title. Whenever she competed, Lee did so representing the Short Hills Club, where she remained a member, even after moving to New Hampshire. Proud to claim Charlotte as their own and grateful to her for all she had done for them, the Club has a “Charlotte Lee Invitational” in November. Like so many champions, Lee was able, upon stepping onto the court, to put all personal feelings aside and concentrate fully on playing her best. Concentration and intensity characterized her game and she once said she becomes oblivious to anything but the game when she played, although her intensity did not affect her self-imposed rules of etiquette and sportsmanship on the court. She has made it a practice to compliment opponents on well-hit shots, and more than one fellow paddle player remarked on Charlotte deliberately hitting the ball away from an opponent who might have slipped down rather than taking advantage of the situation to win an easy point as almost any serious competitor would do. 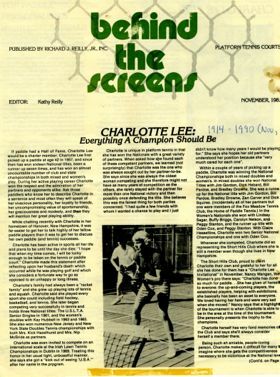 Lee’s sportsmanship was so widely recognized that the APTA published a platform tennis etiquette booklet featuring comments on the subject by Charlotte Lee. One of Charlotte’s unwavering principles was to always play paddle for fun. Although she has had offers to teach for substantial monetary reward, she always refused, even when she was seeking employment after her husband’s death. “I consider myself a true amateur and could not work for money at the thing I loved most. It would take away from my enjoyment of the game, so I would rather just keep it as a hobby.” Of course, Lee’s refusal to teach for money did not prevent her from teaching for free, although she only considered it “helping” and she was always willing to do it. Highly respected for her grace and sportsmanship, Lee was always willing to lend a hand and help players of all abilities. Up and down the East Coast, she was seen at openings of new court facilities to give clinics, exhibitions and lessons. She’d always bring three other ladies with her, and remain long after the exhibition was over to hit balls with anyone who wished. She never received a penny for all her efforts, seeking merely to further advance the game she loved. And she wanted others to have the same love and fun with the sport of platform. Special memories included her starting each match with the admonition: “If there are any problems on either side of the net, we’ll play a let.” Funny, there never seemed to be any problems in her matches! Then there was the time a fine tennis player and up-and coming paddler strutted out onto the court and began to lick her chops when she saw the tall, rather elderly player opposing her. Less than a half hour later, she was licking the wounds of a double bagel loss. An impeccable dresser, Charlotte also made a habit of rotating her 12 pairs of sneakers on a daily basis. At the Short Hills Club, the ladies’ singles tournament was played each June. The winner was then allowed to play Charlotte for the club championship. Guess who always won? Charlotte was born in Baltimore, MD, and attended Bound Brook High School in Bound Brook NJ, graduating in 1933. While there she achieved the distinction of being the second girl in the school’s history to be elected President of the Student Body, and was awarded a medal for being the best all-around girl athlete. She later attended Ballard Secretarial School and worked at American Cyanamid where her husband, Dr. 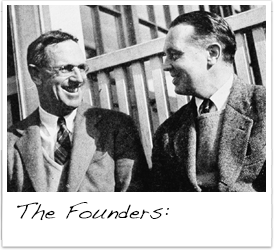 Slaughter Warren Lee, a lineal descendant of General Light Horse Harry Lee, worked as an organic chemist in the Research Laboratories. Sources: Adapted from Kathy Reilly article in Platform Tennis News, Winter 1991; Behind The Screens, November 1985; Nancy Mangan and Oden Cox, Platform Tennis News. Charlotte Lee (1914-1990), an outstanding champion despite only starting to play the game in her early forties.